How does your body reacts when you don’t meet its needs? How does it reacts when you strive to achieve its needs? We can learn to make tiny changes in our behaviour to turn bad habits into amazing new habits – ones that will really help us to become the best you can possibly be. Breathing is our fundamental need – it is the food for our cells to live! We don’t often think that we can make our lungs work better or protect them from the damage of toxic fumes. You will learn how to breathe your way to wellness. When we’re stressed we naturally start to breathe short fast breaths which means that less oxygen is entering our lungs, which leads you to feel even more stressed! By noticing this, and by learning to take slow deep breaths we can calm ourselves down. 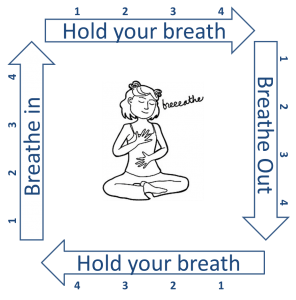 The square breathing technique is a useful tool to try next time you notice that you’re getting a bit stressed. Check out the video below to see how it’s done! Staying up late can be great, but fatigue, insomnia, and irritability are not cool. Let’s look at the upside of early nights, loving your sleep, and the magnificent way a good night’s sleep can make you feel. Exercising is an anti-depressant – it boosts your energy, improves your sleep, memory, confidence and reduces your risk of illness – the benefits are endless! There are so many ways to move – find your way to love and just do it. You probably know that junk food and soft drinks are addictive, but there are even ‘good’ foods that can cause some of us to be inflamed. We are all unique. Discover your well habits of eating and drinking so you can feel and be well. 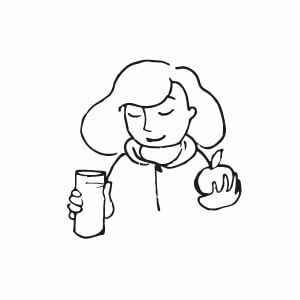 In the video “Nudging our kids and families towards better eating,” Dr. Mike Evans presents a simple way to think about eating well. Am I eating enough or too much? Are my kids eating enough or too much? Am I eating the right food? How can we make it easier for the whole family to eat better? In this important talk, clinical psychologist Julia Rucklidge explores a range of scientific research, including her own, showing the significant role played by nutrition in mental health or illness.